There are times, like after a night out, a particularly miserable day, or a rough break-up, that I welcome the absolute lack of restraint that most takeout restaurants exhibit when it comes to salt, sugar and oil. Oh yes, nothing soothes a broken heart quite like massive amounts of some seriously artery-clogging cuisine. But for every day dinners? No way. I’d prefer to avoid buying extra tickets for the cardiac arrest lottery. 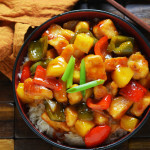 Even the veggie-filled options are extremely unhealthy, which is a shame because American-Chinese food can be so flavorful without overdoing the unhealthy aspects. 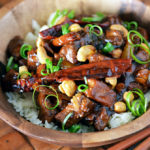 So when a craving strikes for soy-sauced dinners, I give them a go in my own kitchen instead, in a quick, easy, and much healthier version than the typical takeout. In fact, I’ve decided to redo takeout and fast food classics for the rest of the month! 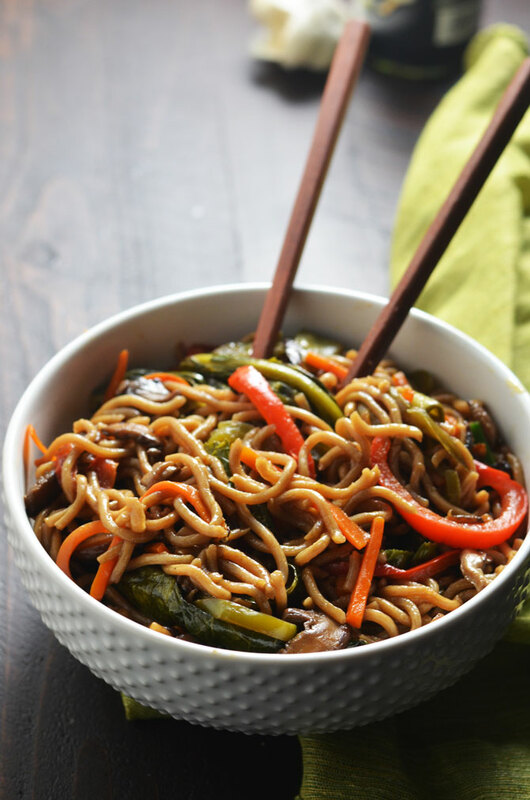 The first post in the series was Sweet & Sour Chicken, and today I’m sharing with you some Loaded Vegetable Lo Mein! 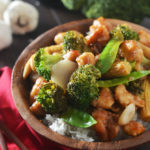 Unlike the lo mein you’ll usually get when you order out, this recipe focuses on getting a large amount of vegetables in the mix without relying on tons of oil. There seems to be this idea that you have to use a lot of oil in order to properly saute large amounts of vegetables, but it simply is not true. Because vegetables easily steam to a tender texture due to high water content, you don’t have to saturate them with oil to get them to cook nicely. Just a bit will give a stir-fried bite to them without making them greasy. Vegetables are porous and tend to soak up whatever you cook them in, so make sure you’re letting them absorb the sauce mixture instead of too much oil, and you’ll wind up with a more flavorful and healthier final product. 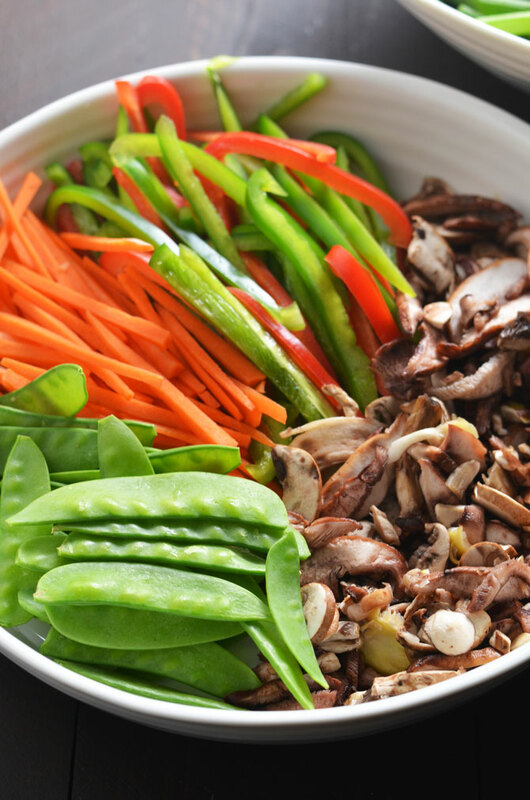 For this recipe, I used a mixture of shiitake, cremini, oyster, and porcini mushrooms that came as a pre-packaged blend, bell peppers, carrot, snow peas, green onions, and leafy greans as my veggies. You could easily substitute your own favorite vegetables or just use up whatever you have lying around in your fridge. Similarly, if you can’t find lo mein noodles at your local grocery store, use whole wheat spaghetti instead. It seems like a strange substitution, but the difference is almost unnoticeable when you add in all of the vegetables and tasty sauce! 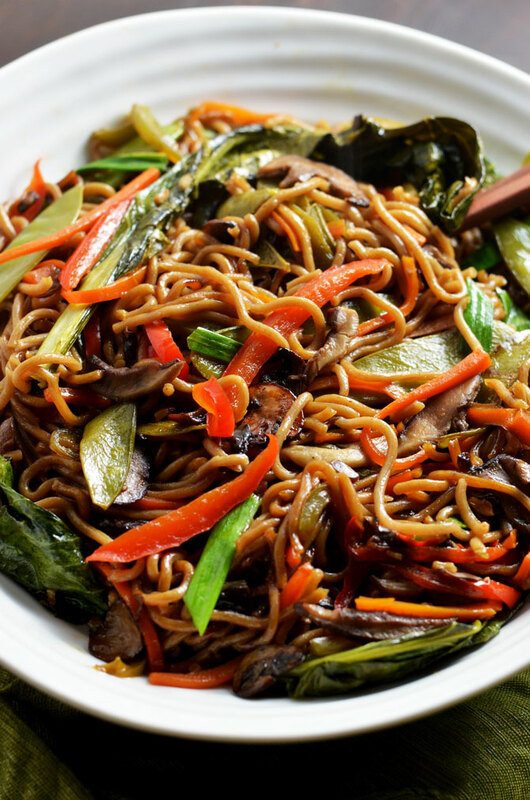 Typical Vegetable Lo Mein contains 310 calories for a 1 cup serving, and nutritionally, you’re not looking at anything great. 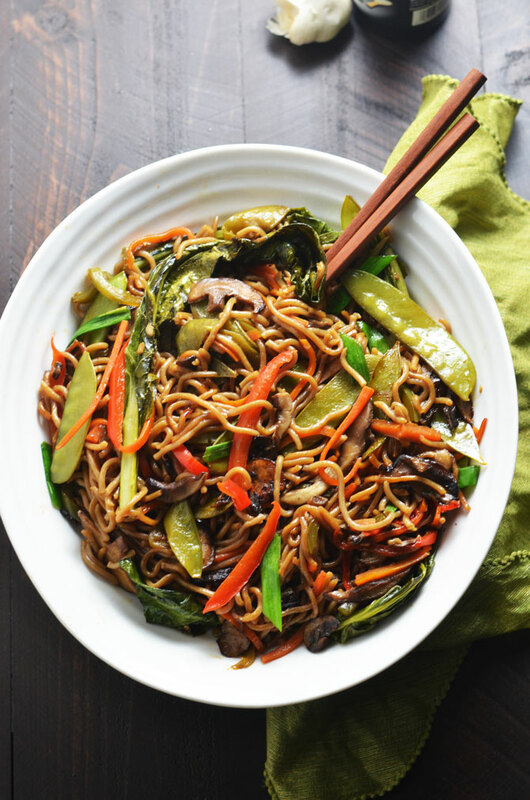 This Loaded Vegetable Lo Mein version, however, is 202 calories per (larger) serving, is low in saturated fat, high in dietary fiber, and is very high in manganese, selenium, and vitamins A, B6, and C! Finally, a Chinese takeout recipe that you can actually feel good about eating, and you don’t even have to give up your beloved noodles. Not to mention, it takes less than 30 minutes to make! 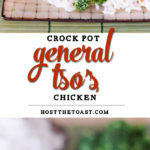 When you give this recipe a go, be sure to tag #hostthetoast on Instagram or Twitter and show off your colorful, healthy, homemade dish. In a small bowl, whisk together the soy sauce, honey, sesame oil, and cayenne pepper. Set aside. Heat the cooking oil in a large, high walled skillet or wok over medium-high heat. Add in the garlic and ginger. Cook, stirring often, until fragrant, about one minute. Add in the mushrooms, bell peppers, and carrot sticks. Once the peppers begin to soften, add in the snow peas, green onions, and leafy greens. Cook until the greens begin to wilt, and add in the lo mein noodles. Pour the soy sauce mixture over the noodles and stir fry until the noodles have absorbed the sauce and the vegetables are all cooked. Serve warm. To make this recipe vegan-friendly, replace the honey with sugar. This was really good for supper tonight. Made it with sticky sesame chicken wings, for the meat eaters, roasted asparagus, and veggie spring rolls for a wonderful dinner. Thanks so much for the great recipe! I love how it is so much more veggie filled than most lo meins. I realized it’s new to me. Nonetheless, I’m definitely delighted I stumbled upon it and I’ll be book-marking it and checking back often! Do you boil the noodles before? Yes! Cook the noodles before! We made the mistake of not cooking them and having to pull each noodle out of the scalding liquid to boil them. After reading other lo mein recipes, it appears as cooking noodles as per package instructions! Just made this tonight and it was YUM!!!! Thanks for the recipe!! I can’t wait to mix it up with different veggies and proteins! I’m so glad to hear it, Kasey! This was really good. I couldn’t find lo mein noodles and substituting whole wheat spaghetti just seemed…wrong, so I used three packs of instant ramen noodles (sans seasoning, of course). Success! 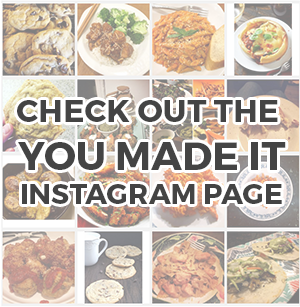 Hi, I’m typically a recipe-blog lurker. Sneak in, try recipe, never post. But I had to tell you that this recipe was easy and delicious! I changed a couple things (which weren’t really a change, just personal preference). I had red-pepper oil in my house and used that instead of the cayenne. I used portobellos instead of a mix (its all I had). I made twice the amount of sauce (I like mine saucy) and used refrigerated lo mein noodles. I’ve been looking to get more veggies in our diet, especially because my husband is a “meat and potatoes’ person, and he had THREE servings of this in one sitting! Great to make ahead for lunches during the week! Thank you! I’m so glad to hear it, Eleni! Thank you for letting me know! I made this recipe tonight. It was very good. I would just note to Vegans… the lo mein noodles (dry) that I purchased at the grocery store contained powered egg whites. You will need to check the ingredients of the noodles you choose. I may cut back on the ginger next time so it is a bit more kid/family friendly. Will definitely make this part of the rotation.